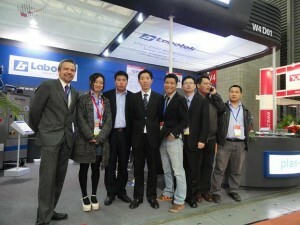 Labotek reports strong results on the back of ChinaPlas 2012. Labotek a leading supplier of plastic ancillary equipment have reported excellent results following ChinaPlas 2012 in Shanghai. Labotek’s sales staff reported strong enquiry levels whilst exhibiting with their China based distributor Plas-e at this years event where they displayed their portfolio of high class products. The popular DDM mobile dryer was running live at Labotek stand and was connected to a production cell, plus vacuum hopper loaders and central materials handling solutions were also exhibited. “Both local and international customers made their way to our booth and were introduced to our latest technologies and energy saving solutions. Especially the Gravi-Dryer which has been well received and we look forward to continuing these projects in Asia. Labotek has a network of companies and agents across Asia in China, India, Japan, Korea, Taiwan and Thailand. Labotek supply equipment designed for drying, transport, dosage and storage of free flowing plastic granules and the transport of free flowing powdered materials. Labotek is considered as leading supplier for developing energy efficient solutions for our equipment, obtained through use of frequency controlled motors, moisture dependant regeneration systems and Labotek Energy Saving System.